Roll out the red carpet! Ready the brass ensemble! Hurl confetti like there's no tomorrow! Questers and slayers rejoice - we've got a brand new quest for you this month and with it comes the availability of the 400th RuneScape quest point. That also means one more slayer prefer & block slot is available, and a new pet. This quest, which is live today (Monday November 19th) was designed by Mods Osborne and Krista. It's a novice quest, meaning there are no requirements and that it's open to everyone, and set in the Piscatoris peninsula. It's a story told from multiple perspectives, focussing on a local family and the Needle - a powerful artefact created by the elder gods to aid them with their planetary constructions. Something horrific has happened... but due to the powers of the Needle, the whole site is trapped in some kind of time bubble, leaving an untouched crime scene for you to investigate. You'll be using a search engine of sorts, entering clue words that you have discovered to unlock glimpses of history stored inside the bubble. As you discover more clues and clue words, further plot is revealed, finally giving you the chance to save the unfortunate individuals trapped inside. This is the latest in a long history of detective quests, following the likes of Murder Mystery or One Piercing note. And just like One Piercing Note, it's a fully voiced quest, and an all-female cast. And, of course, you'll have access to another elder artefact - the Needle itself. No doubt that will come in handy in the future (or past) too. Tossing your food scraps down a well can't do much harm, right? This is possibly true, providing said scraps aren't feeding a giant slime, which then emerges from the well and terrorises the local populace. Slime is of the Essence is a new community event that will run for five days. Over the course of five days players will need to help defeat King Slime in Rimmington by lending a hand to a host of quirky characters. Players will need to employ a new skill each day, and free tools will be offered to help get the job done. Your reward? We're not going to spoil that surprise completely, but there will be some tiered Slime Hunter armour, an animation and a slime pet up for grabs. Players will be able to start the event by popping down to Rimmington when the event begins on Thursday November 22nd. One thing to note - we had a great time coming up with a name for this one, although it's an absolute crime that 'Goo'd Well Hunting' didn't prevail. This truly is the darkest timeline. 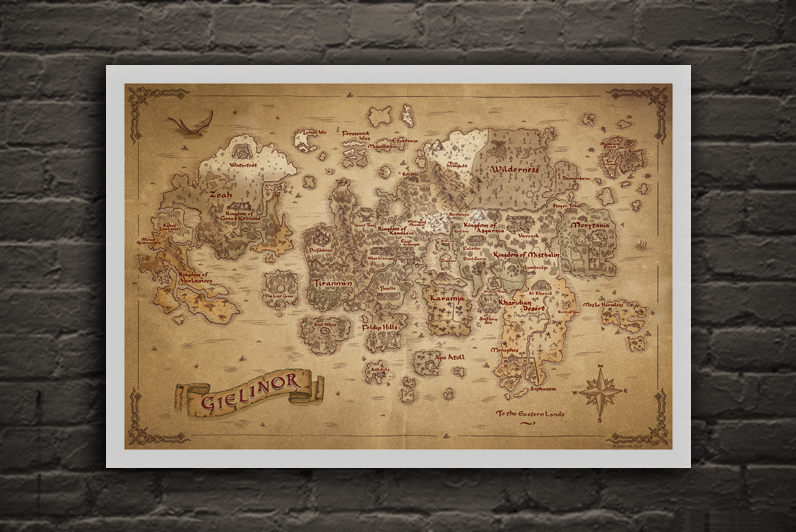 NEW Illustrated Map of Gielinor available on Official Merch Store! You might have seen this new map of Gielinor offered as prize in a recent survey. Now you can own a copy for your wall. Fine Art Prints are available at 4 different sizes on the store. Click here to see sizes and prices. Featuring iconic locations from both RS & OSRS and a few familiar creatures, the map is a decorative representation of the shared fantasy world in which the RuneScape games are set. These are high quality prints on premium materials and the prices do reflect this and we know this might not be for everyone. If you want something less premium, we will also be adding a 80 x 40 cm deskmat featuring the map and a smaller mousemat to the store end of December/early January. The map can also be found on the sleeve art for RuneScape: The Orchestral Collection on vinyl and CD which should be shipping over the next couple of weeks (currently available for pre-order at Laced Records. Thanks to everyone who took part in our survey last month for the chance to win one of these prints. We have contacted our winners and contacted them through their in-game message centre! The Clan Noticeboard can now save events more reliably! Fixed a bug that caused certain sections of the wider menu buttons on the Options Menu from being unresponsive to taps. Overhauled the Expert Skillcape Shard Bag for both clients. Updated the shards to use interesting colourful sprites that match the respective shard object. Added skill icons to each shard to identify at a glance which ones are which. Indication of which Expert Cape of Accomplishment has been unlocked. Tapping a shard within the bag will inform you whether or not you have collected it. Fixed an issue where the new choice select options were not displaying correctly for an interface we have zoomed in on. We have removed the changing contextual button that changed the home teleport icon. Instead we have returned the extra buttons at the bottom of the worn equipment interface, we have increased the size and spacing of these buttons noticeably. As part of this fix, rejoice for full access to the currency pouch has returned. Users can now access Oddments, Rare Item Tokens, Bonds etc... from the currency pouch. We have made further improvements to the dungeoneering party minigames interface on both PC and mobile. Primarily around the size of buttons and the spacing of UI elements. We have improved the Player-owned Ports Ships minigame interface elements so they are easier to tap and fill the interface better on mobile. We have increased the size of the Hefin serenity posts minigame interface elements so they are easier to tap and fill the interface better on mobile. We have increased the size of the livid farm minigame interface elements so they are easier to tap and fill the interface better on mobile. Added a combat indicator (flashing red border) when you have an interface open that covers the full screen. This will let you know that you are in combat and being attacked. The speed of the flashing will increase as your health drops. between 10 and 25 % health -> Flash every 1.5 seconds. between 25 and 50 % health -> Flash every 2 seconds. > 50 % health -> Flash every 2.5 seconds. We have added special drag and drop areas on the left hand side of the backpack on mobile. Drop area is there by default for all users. This is also slightly larger. This is there as an alternative to right click to drop or destroy anything. It also serves as an indicator as to what you are doing. Dropping an item in the game world can be confusing. At the relevant magic levels a low alchemy, then later a high alchemy drop area exists below the drop area. Lastly once you have passed the point in the tutorial a disassembly drop area is added. These are all sized so that they are all visible with the smallest inventory size on mobile. Dailyscape and Portnight achievements will no longer reset after completion if their respective streak is broken. Fixed an issue where some achievements weren't counting towards total achievement completion. You'll no longer get reminders about failing the achievement Source of Denial if you've already completed it while doing the new Sq'uirk achievement. Pizzas can now be delivered to all highwaymen. Players that have filled their toolbelt will now receive the 'Get tooled up' achievement as expected. Players will now receive the 'Reverent Sculptor' achievement when talking to Copernicus Glyph with all five God chisels in their inventory. 'Hacks' achievement is now correctly marked as F2P. Players that own a full set of superior player owned ports gear will now receive the related achievement as expected. The farming skillcape perk can now be used to unlock the 'Smartest Harvest' achievement. Ring of Kinship upgrade achievements will no longer be lost when the ring is reset. Adjusted the grammar on some achievement titles and descriptions. If you have the complete from Shield of Arrav before the quest rework was completed without finishing the quest, you can now properly complete the quest. Resolved issue within the sentence displayed within the Quest Store when claiming more rewards. Ironmen that come across stray parcels from the hedge will have them cleaned up when attempting to interact with them. Hellion aura can no longer be reset with the Premier artefact. The Premier Club artefact slayer boost will no longer activate when you haven't activated the boost. Virtual levelling announcement now points to the correct place in settings. The shadow barrows transmog rings now have the correct weapon models set. Fixed an issue that prevented certain players from obtaining the Toy baby dragon during 'From tiny acorns'. Slayer VIP Coupons are now free-to-play objects. Achievements for Elite Dungeon boss kills have been combined for the purpose of reducing total requirements for the Final Boss and Insane Final Boss metas. Solo kill achievements remain untouched, but are removed from FB/IFB. Clicking on the Treasure Hunter button in the lobby now opens the interface as expected. Added some blocking to the rocks in the Araxxor cave at the end of path 3. Players will no longer log in to being stuck in the river next to Gunnarsgrunn if they hadn't logged in since the river widening. FIxed a graphical issue when turning into Linza with Ring of the Disgraced. The skybox & filter options, access from the world map button's right click menu, has been reworked. In Advanced, various settings can be set and saved as a preset. Beware, you may cause some strange looking effects. Sun colour, sun ambience, fog colour and depth as well as volumetric light colour and density can be set to custom values. Added antigriefing to all of the Skillchompas hunter areas. Visually updated the bug reporter, additionally included support center links for specific bug categories. Entering couldn't be simpler, and if you've been an avid 'Scaper then you know what to do - just head to this page. You have been requesting more opportunities to exchange with us on current projects, or simply address all sorts of questions that could rise during your adventures in Gielinor - now's the time to answer them! Join our JMods on the sofas for a general Dev Q&A, a time where you can ask us anything live on the Twitch chat. I'm definitely hoping to get my hands on that map sometime soon. Looks awesome!